This is my Morocco story. It’s the only exception from the Arab world (may be Tunisia as well) that has kept the Islamic religion and opened the doors to the western tourist industry without changing any of its beliefs. 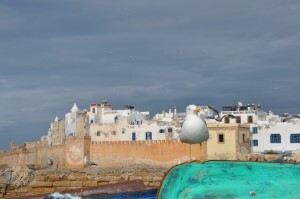 For many years now the connection with the nearby Spain via Gibraltar has brought prosperity to Morocco. 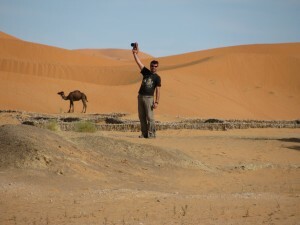 As a crossroad to Africa, the Royal Morocco has made it to the map of many tourists. The diversity of landscapes, the human kaleidoscope, the kindness of its people and the long-lasting peace have made Morocco one of the easy and safe tourist destinations. All that and much more brought me there. When you arrive in Ceuta, a city on the Moroccan side but still considered Spanish, you immediately get the African feeling. Crossing the border was a piece of cake considering the border crossing of other African countries. My first stop was the seaside Marlit, a truly Moroccan city. The beach was nothing to write home about but as an introduction it was a peaceful place. I met two Greeks there. I couldn’t figure out what exactly they were doing in Morocco but I tried to be discrete. After that it was time for Chefcahouen in the mountains. This area is considered to be the hashish homeland as every second man’s job is growing cannabis. What does the king do to get something out of that illegal activity of his subjects? He buys the hashish legally and exports it to Holland. 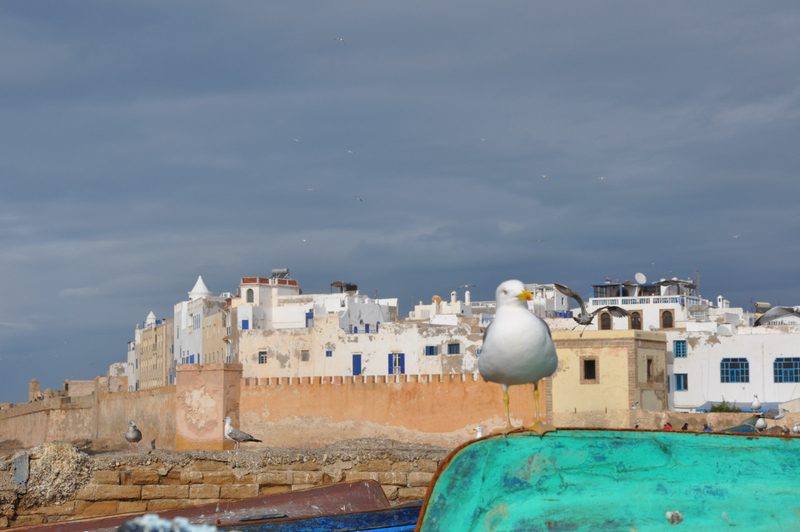 Except for the numerous hashish sellers that approach you, Chefcahouen has a picturesque little medina (fortified city) and many trekking opportunities to the surrounding villages. 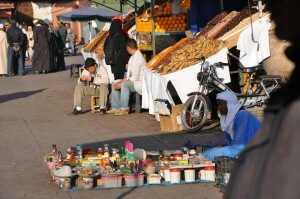 After passing through there, I headed to Casablanca just because I had been hearing about that place for so many years. Except for a truly impressive, humongous mosque, I didn’t find any other reason to stay there any longer so I headed to the imperial cities. Each one of them was at its time the centre of the dynasty that ruled Morocco. The first one was Rabat, at the moment the capital of the country and the king’s base. There I met Mr. Kostas Pistikos, an employee at the Greek embassy and president of the Greek community in Africa. He was my mentor in Africa and I would like to thank him for that. 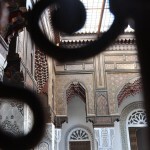 I spent two days at his house and under his guidance I saw Rabat from a different point than most tourists do. 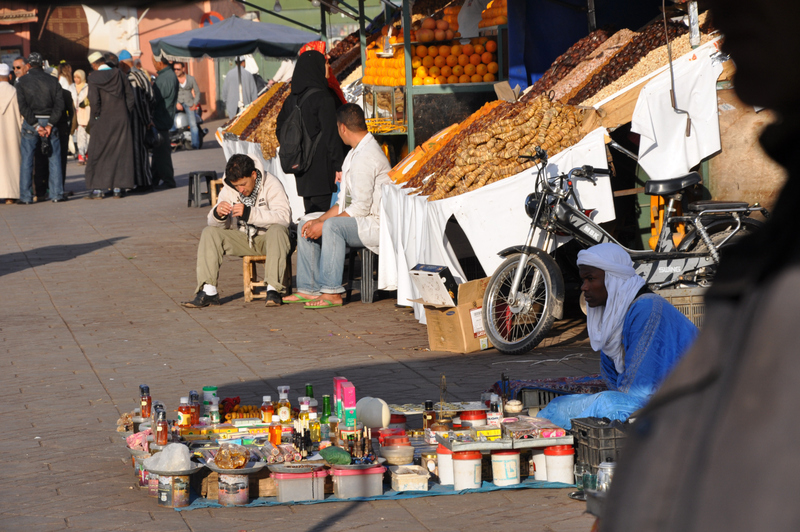 Rabat has one of the loveliest souks (market), right in the centre of its medina. I didn’t get to meet the king but I managed to get my Mauritanian visa which was my purpose. After many tips about Morocco and West Africa, I said goodbye to Kostas and moved on to the next of my imperial targets, the city of Meknesh. Another impressive medina, many leather workshops that smell terribly and more info about Morocco’s past from my guide, the 16-year old student Mohammed. If you ever go to those places, take a student as a guide than a professional. They are much more passionate about their job. After Meknesh it was Fez, the third imperial city. It was nice to wander around and check out the really unique architecture. I’m not a city person. So after visiting two or three imperial cities I had enough of royalty. It was time for the real reason I was there, the mountain range of Atlas and of course the desert. So after I checked all the touristy imperial cities from my «things-to-see list», I headed to Azru, a city that looked more like a village. The surroundings were a book of trails ready for me. And that’s what I did, I walked them all. The mountain gives you the power to go beyond your limits. I was trekking all day long and late in the afternoon I went back to Azru. It was nice but still a little cold for me. So I headed out to the desert beyond the Atlas Mountain. I spent my first night in the desert in Erfoud, a rather touristy place that tour groups use as a base for their excursions. One night was more than enough for me. 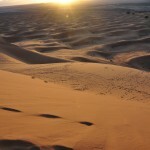 I was on my way to the biggest sand dunes of Morocco in Merzuga. 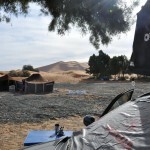 I set up camp at the edge of the village, not to avoid the crowds since they were there only during the day, but to be right at the base of the dune. That first night in the desert felt like Africa as I saw it in my dreams. The next days, having the perfect base, I had the opportunity to explore the surroundings. Voukefalas had the chance to do his first «piste» kilometres (that’s how the desert dirt roads are called). 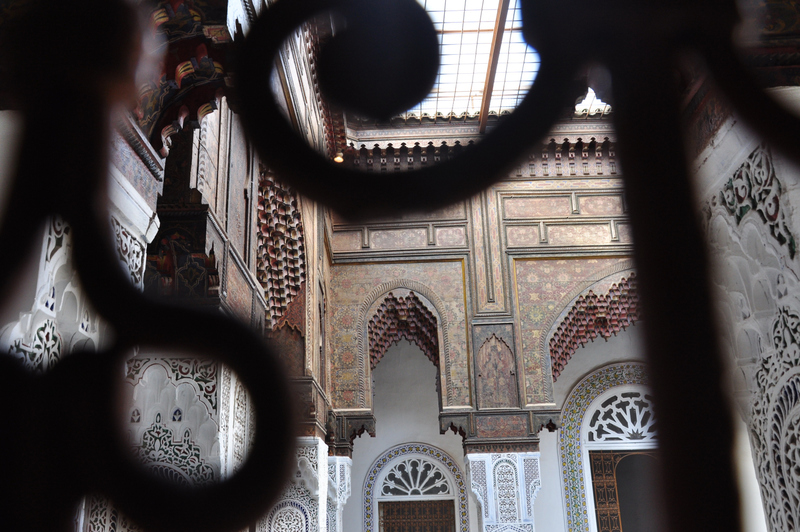 After a quick visit to the great cinema studios in Quazazarte, I arrived in Marrakech. As I mentioned earlier, I had enough of the imperial cities but what happens on the central square of Marrakech is something that you must experience. A rather quiet square in the morning is transformed in a gigantic open air restaurant, a fairground, a circus and a show stage all in one, just for a couple of hours. It disappears in the morning and it appears again in the afternoon of the following day. It’s really a sight out of the past. Esawaira was my next stop and one of the highlights of the country, at least for me. It was a fortified medina, next to the sea and right at the edge of a long, sandy beach. A Woodstock’s generation favourite travel destination, in a few words a great place to be. Many crazy travellers were there but on top of them all, a Japanese guy that looked like a Samurai. He had brought some strange-looking wooden boxes from Japan that could self-lock. It was a very weird object. You have to see it to understand it. Anyway he was there living a hippie life for the past two years, trying to earn his ticket home. After Esawaira the landscape started getting drier and drier letting everyone know that the great sand seas of the Sahara would begin soon. A stop in the village of Mirleft was necessary on the way to the south. A place that doesn’t inspire you at first but with time it appeals to you more and more. The locals’ favourite job was waiting for tourists to show so they could do them some small favour in exchange for money. 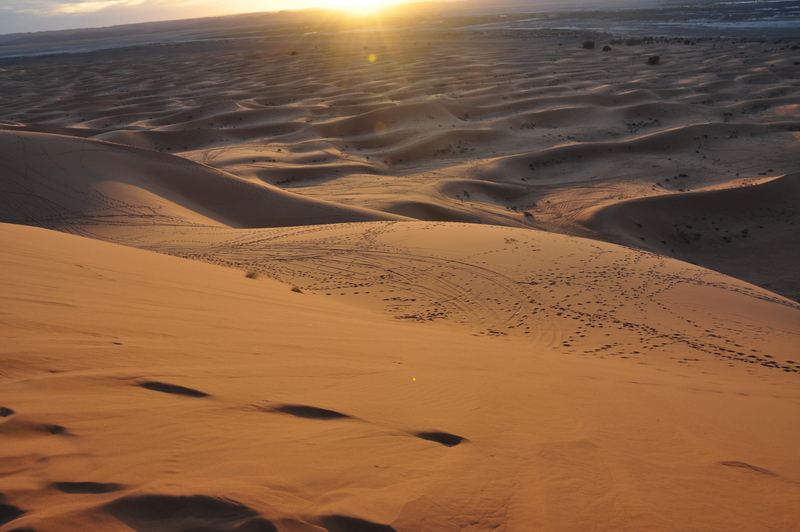 After a couple of kilometres there was Tafraute, the getaway to Western Sahara. Western Sahara is the vast area that used to belong to Spain, known as the Spanish Sahara. After abandoning it the Spaniards gave it as a gift half to Morocco and half to Mauritania. The natives are the Sahraui, the original inhabitants even before the Berber tribes. They wanted their independence but since the soil under the sand was rich, neither Morocco nor Mauritania wanted to give it back. A conflict started and it led to the guerrilla war that still goes on. 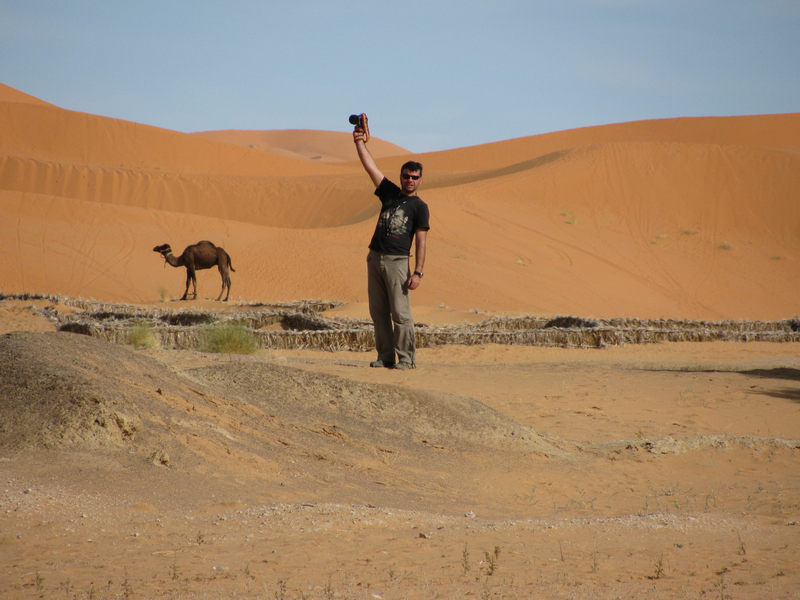 In reality Western Sahara is one of the nicest areas to be in the touristy Morocco. A night in Trafaya convinced me about that. The route after Tafraute is a one-way street in the desert, no right or left turns and no cities except for Trafaya and Dahla. It’s known as the loneliest 1000 km of the world. You have many hours to think and admire the hard but extremely photogenic scenery. From one side it’s the Sahara and from the other the Atlantic Ocean. It’s worth a trip just for that. 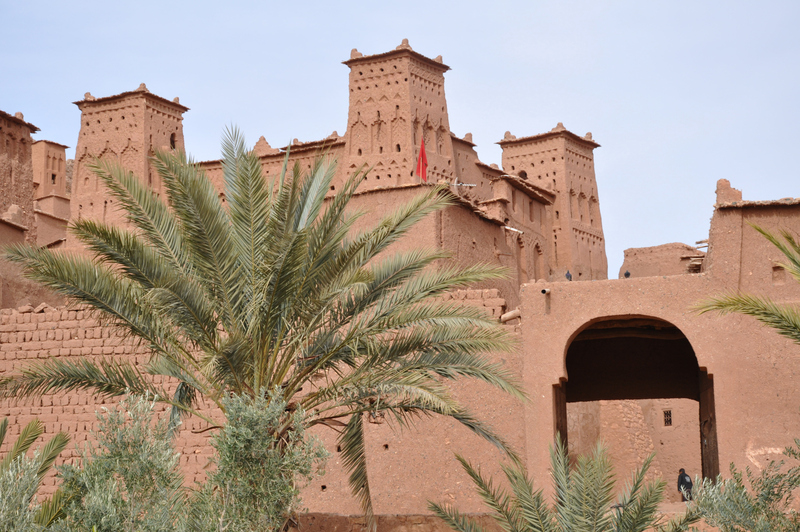 My next stop, the last one in Morocco, was Dahla, a city that seems like it fell from the sky in the middle of nowhere. 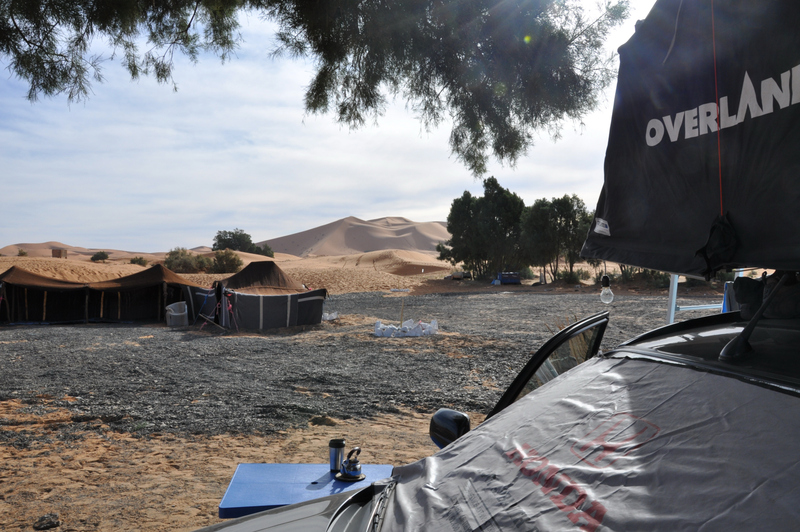 I spent my last night at a camp a little outside the city as the Sahara had gotten into me. I sat next to the sea and got lost in my thoughts. Without knowing what I was about to face in the future, I said goodbye to one more exciting place I had seen and left Morocco.